IN Australia in 2026, every second child could be obese. Most adults will carry enough extra weight to endanger their health and life. And Australia's medical industry will groan under the weight of obesity-related disease. It is a horrific future but one that many experts believe is inevitable unless Australians change their eating and exercise habits, and governments commit to extensive public health campaigns. Australians are gorging themselves to an early grave, or at least to a life dogged with weight-related medical problems. As the numbers of overweight and obese Australians increase, the number of cases of dozens of different diseases will also rise. The Australian Medical Association has warned that unless childhood obesity is curbed, half of Australian children will be obese in 2026. "If current trends continue half of all young Australians will be overweight by 2026," said AMA president Dr Mukesh Haikerwal. Australia's childhood obesity rate is estimated to be rising 1.7 per cent every year. "It's a significant and very pressing problem," Dr Haikerwal said. "What we need is a much more comprehensive whole-of-government and whole-of-community approach." Overweight and obese children are at greater risk of developing chronic disease if they remain heavy as adults than those who become obese later in life. Experts believe the obesity epidemic could see average life expectancy level off or decline within 50 years. The problem would only get worse, warned obesity expert Dr John Dixon of Monash University's Centre for Obesity Research and Education. "If we don't act we are going to have an increasing problem," he said. Every year 100,000 people develop diabetes, which doubles their chances of dying within five years and wipes an estimated eight years off their life. About 400,000 people are diagnosed with high blood pressure and 270,000 adults develop chronic kidney disease. "Obesity and smoking are exacting a similar toll in the community," Dr Dixon said. "It won't be long if our public health programs continue with the success in reducing numbers of smokers and passive smoking, that the burden of disease through obesity and overweight is greater than smoking. "We now have a major epidemic, a major problem with obesity, and will have to take a similar approach as we have to tobacco, alcohol and motor vehicle accidents." Dr Dixon said adult obesity rates in the US were about 10 per cent higher in Australia -- and those looking at the US see Australia's future. "If we think we are reaching a peak and it's not going to get worse . . . think again," he said. 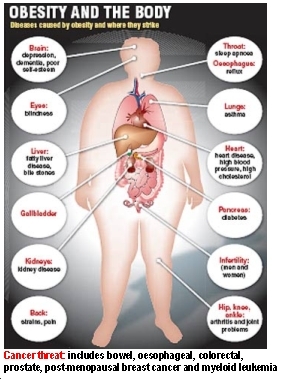 Recent figures have shown that overweight people over the age of 50 have a 20-40 per cent higher risk of death than people of normal weight, and those who are obese have a 100-200 per cent higher risk of death. "Obesity-related diseases all cause reduction in quality of life and can impact mobility and physical activity," Dr Dixon said. He said obesity needed to be treated as a disease. "We still have politicians who accept diabetes as a disease but do not accept obesity as a real disease that drives these other diseases." Obesity and its associated illnesses are estimated to cost health services $1.2 billion a year, and the costs continue to expand as fast as the nation's girth. THE Great Weight Debate is on Channel 9 at 8.30 tonight. The official scorecard to test your diet knowledge while watching the show is on Page 15 of today's Herald Sun. Your say: Should there be a tax on fattening foods?